55 years ago this month, Poetry magazine published what became one of the most famous poems in African American and American literary history. The periodical published a series of poems by a then 42-year-old writer named Gwendolyn Brooks. The series, entitled "The Bean Eaters," included "Old Mary," "We Real Cool," "Strong Men, Riding Horses," and "The Bean Eaters." Brooks had received the Pulitzer Prize for Poetry in 1950, but it was "We Real Cool" that became her more famous poem. 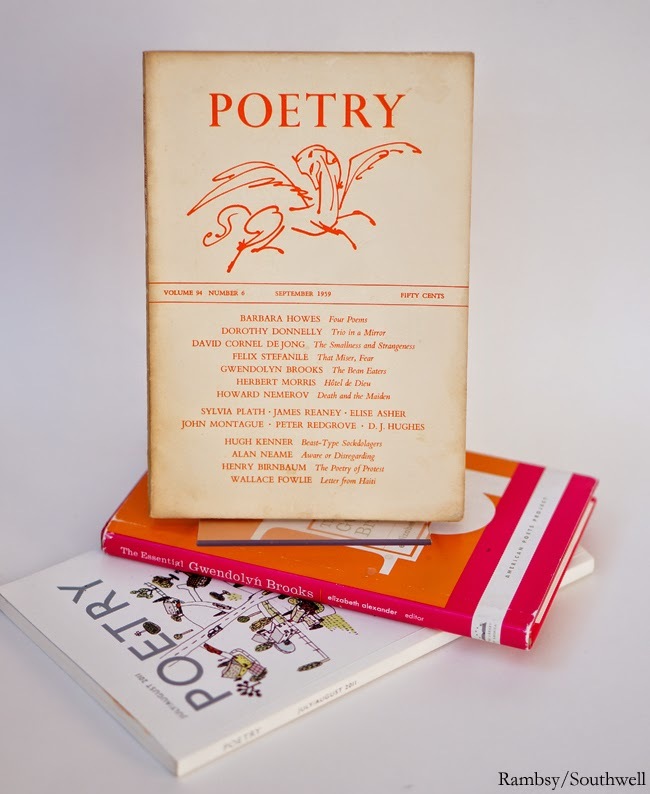 I've thought and written about the circulation history of Brooks's poem for years now, so I decided that if the opportunity ever arose, I would acquire the September 1959 issue of Poetry. Well, I spotted one online recently. And for $35, I felt like I got this literary artifact at a really good price. The series of poems that appeared in that September 1959 issue of Poetry served as a preview for Brooks's upcoming volume The Bean Eaters (1960). The editor of Poetry at the time was Henry Rago, who served in that position from 1955 - 1969. Sylvia Plath and Howard Nemerov, among others as listed on the table of contents here, published works in that issue as well. Almost 10 years after the initial publication of "We Real Cool," a large number of anthologies featuring black poetry began to appear. The widespread publication of those collections and the repeated reprinting of "We Real Cool" solidified its place in American and African American literary canons. • The curse & blessing of "We Real Cool"
• "We Real Cool" & "For My People" First Appeared in Poetry Mag.